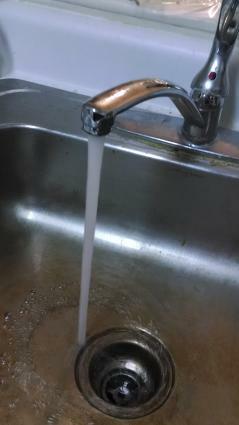 Faucets like these can use a gallon of water every 20 seconds. Even making simple decisions about water usage can have a tremendous influence on an individual's overall water consumption. According to the U.S. Geological Survey (USGS) of the United States Department of Interior, the average American consumes between 80 and 100 gallons of water daily. This high per capita water consumption is costly on an individual and a societal level. According to the Environmental Protection Agency (EPA), water bills can exceed $1,100 dollars per year for an average American household. Fortunately, every water-saving decision can immediately reduce an individual's water consumption by several gallons. Washing machines consume substantial amounts of water. According to the Community Science Action Guides published by the Franklin Institute Science Museum, a standard washing machine cycle requires between 40 and 55 gallons of water. People can save 30 gallons per cycle by choosing a water-efficient washing machine. Households can also save water by potentially changing their washing habits. Doing a small number of large loads of laundry per month is more water-efficient than doing a large number of small loads per month. A person's exact dish-washing procedures can make all the difference in terms of water efficiency. Continually running the faucet while washing the dishes consumes a significant amount of water, since older faucets often use three gallons of water every minute, according to the Community Science Action Guides. Based on USGS statistics, dishwashers can consume 10 gallons of water during a full cycle. However, USGS statistics also state that washing the dishes using even a newer, more efficient kitchen faucet consumes 2.2 gallons of water for each minute of washing. According to Community Science Action Guides, washing dishes by hand for only five minutes would use between 11 and 15 gallons of water (depending on the age of the faucet), making the process less efficient than running a full dishwasher load. While some people may be able to completely wash a full load of dishes in under five minutes, most people would save more water using dishwashers. The process of outdoor watering can lead to a water expenditure of between five and 10 gallons every minute, according to USGS. People with larger lawns may use even more. Watering the grass manually with a watering can is more water-efficient and helps prevent the grass from becoming saturated with water. People may not use as much water with personal care habits as they do with habits like watering their lawns, but the water consumption still adds up over time. According to USGS, bathroom faucets require between one and two gallons of water a minute, depending on whether the faucet is new or old. People's exact water consumption during personal care routines will vary according to how long it takes them to wash, shave, or brush their teeth. Individuals that take a minute to complete each activity, assuming they are using a newer faucet, will consume three gallons of water. Ideally, people should keep the water off during the physical tooth brushing process and only turn on the water for the rinsing at the end. Individuals may want to replace older faucet fixtures with new ones if they have reason to believe that they are working with older, less efficient faucets. The water efficiency of showers depends on the length of the shower in question, and the flow of the shower-head. With baths, it usually depends on the extent to which the tub is filled. Showers and baths can both be water-efficient or inefficient. Baths have an advantage over showers, seeing as how there are literally built-in limitations to how much water can be used for one bath. Showers are much more open-ended in terms of water consumption. USGS suggests that the older shower-head models may have consumed five gallons every minute, and Community Science Action Guides put the figure at closer to seven gallons per minute. Ten-minute showers using these models would consume between 50 and 70 gallons of water. USGS indicates that most newer, more efficient shower-heads may use 20 gallons of water for a ten-minute shower. Showering with efficient shower-heads is more environmentally friendly than taking baths with full tubs, but even these baths are preferable to showering with most older shower-heads. Community Science Action Guides estimate that baths with full tubs will require between 28 and 36 gallons of water, as opposed to 14 to 18 gallons for a tub that has been left half-empty, always depending on the size of the tub. Deciding between shorter, lighter showers or shallower baths is largely a matter of personal preference. In terms of household water expenditure, the toilet is probably the most costly appliance. According to the EPA, an estimated 26.7 percent of residential water use goes to the toilet. Each toilet flush with an older toilet takes six gallons of water, compared to as little as 1.6 gallons using a newer, water-efficient toilet, based on statistics from the Community Science Action Guides. While people don't necessarily have to minimize their flushing altogether, as is the case in drought-stricken areas, toilets shouldn't be used to dispose of anything else. People can also recycle their older, less water-efficient toilets when they are upgrading their homes for increased water efficiency. Anyone whose toilet dates back from before 1994 may want an upgrade. The amount of water that people in the industrialized world use on a daily basis can be shocking at first glance, but water consumption is well within everyone's control. The contrast between water-saving appliances and standard appliances is striking. Purchasing water-efficient appliances can help everyone save a great deal of water quickly. Water-saving can quickly become an almost invisible habit after households make the initial purchases of water-saving appliances.